Recently, I’ve become obsessed with United States patent applications. Specifically, I’m interested in patent applications from large tech companies. 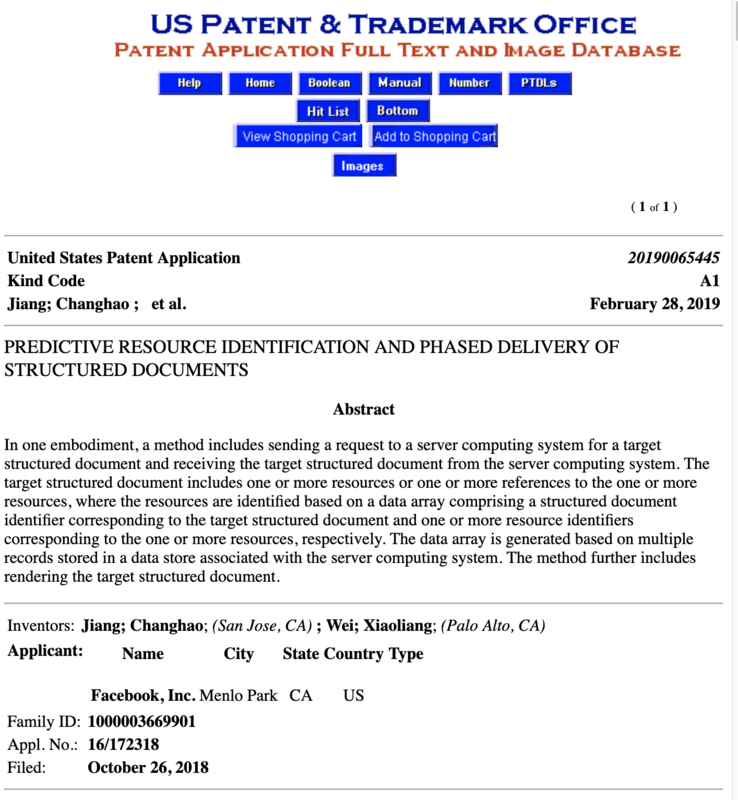 I started reading about patents when I came across some patent applications from Microsoft in an article about facial recognition software. I found the dry and legalistic nature of the patent language fascinating, given the implications of the subject matter. So I googled “how do I find out what patent applications are released” and I found a glorious piece of software: The USPTO’s Patent Application Alert Service. Now, every week, I sit down with a cup of coffee and read through patent applications. In this post we’ll cover why I do this, what this USPTO service does, what patent databases are available to the public, and what I’ve done to make the release of patent applications more accessible for my team. What are patent applications and why are they important? As you can see, patent applications contain useful information for the public and reveal what companies consider to be innovation worth protecting. 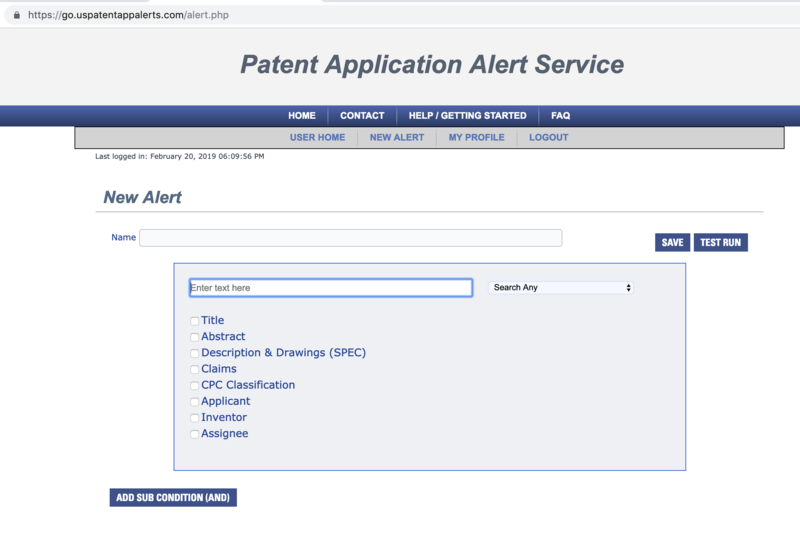 To persuade you that patent application alerts are important, I need to talk a little bit about how patent applications work. When a company like Facebook or an individual person believes they have invented a novel “process” or “machine,” among other things, they can apply for a patent to prevent another entity from making, using, or selling their invention without their consent. In order to obtain a patent, companies are forced to make a tradeoff. While they stand to make money by protecting their idea, they also have to disclose that idea to the public when they apply for a patent. By law, patent applications must be made public within 18 months of being filed. However, there are few exceptions. First, there is something called a “provisional” patent application. A provisional patent application allows an applicant to establish an early filing date, but the USPTO does not make it public or determine whether to grant a patent unless the applicant files a regular non-provisional patent application within one year. If the applicant doesn’t file a non-provisional patent, the provisional application is never made public. There are two rarer examples of non-published applications and issued patents. First, there are those filed under foreign patent protection. Second, the USPTO may determine that an invention has implications for national security. Those examples aside, in general, after a US patent application is filed, it will be published by USPTO for the public to view (regardless of whether it has been granted yet). So, you may be thinking that means the Patent Application Alert Service (PAAS) spits out an alert for every non-foreign, non-provisional, and non-national-security related patent application before a patent is granted, but this isn’t exactly true. Applications that come through the application database will result in alerts to PAAS. However, in some cases, a patent may be approved before the 18 month publication deadline. There are two major public databases for doing full-text searches for information related to patents: AppFT and PatFT, which contain information for patent applications and patents that were approved. There are thus applications that are published and indexed in AppFT that will eventually be granted, and those that may never be granted. However, all patents are published and indexed into PatFT (except the ones with national security implications). Thus, those applications published prior to grant and then eventually granted live in both databases. However, dealing directly with AppFT still gives us a lot to work with. With that in mind, let’s discuss the alert service. PAAS is the system that provides customized email alerts when a patent application is published. It was created to allow the public to monitor the latest patent application releases. You can use the service to add alerts for a variety of search terms. While these alerts definitely make it easier for reporters to report on companies’ patent applications, the central reason for a patent alert system is to spur innovation. USPTO thinks that if people have easy access to patent-related information, they will file higher quality patent applications and pursue novel inventions. This is because patent filings require you to prove your patent is novel using “prior art”. “Prior art” is anything that can be used as evidence your invention is already known. USPTO thinks that if it can help you find “prior art” that shows your invention isn’t novel, you won’t apply for a patent. The more visible patent applications are, the more discoverable the “prior art”. I get the best luck with just searching for terms and selecting “Applicant”. All the other categories will give you too much noise. I love reading the patent applications. To me, they seem like an unfiltered look into what these companies were working on in the language the engineers would use to describe it. Interestingly, there seems to be a disconnect between the engineering teams building these products and the PR teams who BuzzFeed reporters usually hear from. For example, while Amazon PR downplays the extent to which their facial recognition technology could be used by law enforcement, the language in their patents revels in those possibilities. This is because the incentives of the IP lawyers and the PR departments are misaligned. The lawyers’ and engineers’ goal is to get the patent approved, not to write the patent in such a way that hides a technology’s dystopian features. If you are thinking of working at a large company, read their patent applications. It’ll give you a great look into their work. I almost immediately started annoying my Twitter followers with patent-related tweets once I started getting these alerts. EYE TRACKING USING TIME MULTIPLEXING: "system implements time-multiplexing by configuring a source assembly comprising a plurality of light sources to project at least a first light pattern towards the user's eye over a first time period"
Are they building Hunger Games??? I wasn’t super happy with the formatting of the email. I’d have to go through and click on every link, and go out to its individual page to read about it. So I had a thought: What if I could turn this email into data that I could display the abstracts and titles only? What would that look like? My goal was to make PAAS more accessible for people in a hurry to discover the most interesting applications right away. I looked to see if anyone had built something that accomplished this goal on Github, but could not find anything. Furthermore, while an API exists for searching the actual patent database, none exists for querying recently updated applications. Lastly, I recognize that patents are a big business. Proprietary software to parse new applications probably exists, but I don’t have access to it. So I set out to make a new Slackbot. My general design of the Slackbot relies on incoming webhooks to Slack channels, sending the data to these webhooks when we receive the email from USPTO. The first question is how we get the data from emails to our Slack webhooks/channels. I already have a DNS entry setup through Route53 so I thought it’d be fun to try out AWS’s Simple Email Service (SES) to make an email for that entry that I could use to forward USPTO emails to. You have to set up email receiving by defining “rulesets” for emails within your account. I set it up to receive UTF8 emails to a patents@mydomain.com email. Then, I hooked up that SES ruleset to a Simple Notification Service (SNS) action, which forwarded the emails to an SNS subscription called patents. Then I went and signed up for PAAS using that email, and received the email on the AWS side through SNS and used the link they provided to confirm my email. Great! Now we had SES -> SNS and then we just needed to hook SNS up to our Slackbot. So there are a couple ways we could go at this point. We can either use https to forward the data to an endpoint as a POST or we could setup a lambda function that gets the forwarded data and forwards it to Slack. I decided to setup an endpoint because I didn’t want to setup deploying the lambda but either would work. Slack has great documentation on setting up incoming webhooks. I created a Slackbot called “PatentsBot” and gave it permissions to post to channels through certain webhooks. and expect my code to parse and understand where it should send any new applications that arrive for those companies and get them to the right channels. Now we just needed to receive it, parse it, and forward it to our existing webhooks. Before this project, I didn’t have experience with receiving and parsing emails with code so I was able to learn a lot about email encoding and the various options available for email parsing in python. This was enough information, formatted in tolerable parsable XML. I decided to pull all the hyperlinks from the email, load their associated HTML, parse out the abstract, filing date, and company name, and then forward that data as a single Slack message, rather than trying to parse out meaningful information from the email alone. This is the code, a build_slack_msgs method, that does the parsing to build messages we’ll send on to Slack. This is receiving json objects from SNS, forwarded by SES, finding all the links that being with the AppFT URL signage, http://appft.uspto.gov., requesting data from each link, parsing that data, and returning some metadata. There are a couple more special packages I want to point out I’m using to parse the emails from PAAS. The first is email’s parser. This package provides a standard parser that understands email document structures, including MIME documents. parsestr takes a string object and then reads the data from the object given. The next package is quopri. quopri performs printable transport encoding and decoding for MIME (Multipurpose Internet Mail Extensions) documents, which is the encoding used in email. It takes the email object and decodes it. Finally, once we have our links list that we’ve parsed out from the email, we’ll use lxml to parse the html associated with those links. We give it our decoded string of html we get as a response from requests and it returns a nicely formatted tree we can use to grep on html properties. Currently I have about twenty channels setup in a test slack, while I only subject my coworkers to about six of them 😅. We’ve been happy to get patent alerts for a variety of companies for the past month, but there are always ways to improve. We should look into incorporating any of USPTO’s APIs. I would like to query the PatFT database for information we might be missing about patents granted before the 18 month publication deadline. We could possibly use USPTO’s PatentPublicData API for that. Another API, in beta, that I’m interested in is the USPTO action rejection API, which allows for retrieval of rejected applications. It would be great to keep track of those applications accepted or rejection as follow-ups. As always, I am open to suggestions for new avenues of research for getting updated patent information as fast as possible. Also, if there are any lawyer-devs out there, please let me know if I could expand on anything or got anything wrong. I have no legal background but am eager to learn! Shoutout to @frewsxcv for reviewing the code here with me and debugging MINE decoding. Thanks to @mkaemingk for editing and @chrswng for chatting with me about patents.